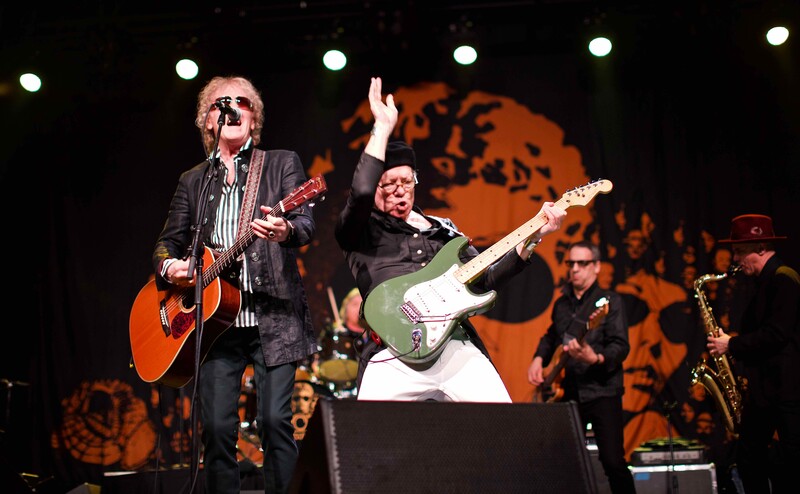 Mott the Hoople singer-guitarist Ian Hunter began last night’s sold-out show at the Cleveland Masonic by singing a few riffs from “American Pie.” But after delivering the line, “ the day the music died,” he added another lyric that set the tone for the group’s two-hour concert. “Or did it?” he wondered aloud as he and a retooled version of the 1974 incarnation of the British glam band launched into “The Golden Age of Rock N’ Roll,” a tune they delivered with Stones-like swagger. The revamped version of the group features members of Hunter’s backing band, the Rant Band, and two old-time Mott the Hoople associates, guitarist Ariel Bender and keyboardist Morgan Fisher. It proved to be a potent combination as the group capably revisited the past and added a few choice covers to the mix too. Wearing his signature sunglasses and a tight-fitting black sport coat, Hunter sounded sharp on tunes such as “Honaloochie Boogie,” a track with a theatrical feel that rivals some of David Bowie’s best jams. He explained he actually wrote the song in the attempt to follow up the success of “All the Young Dudes,” the David Bowie-penned track that would become a hit for the band in 1972. The ballad “I Wish I Was Your Mother” featured a nice mixture of electric and acoustic instrumentation, and a rollicking bit of piano kicked off the careening “Pearl ’n’ Roy,” a tune that really benefited from some squawking saxophone. The bluesy “Sucker” became an engaging sing-a-long that received a standing ovation, and the band took a particularly loose approach to its cover of the Velvet Underground’s “Sweet Jane,” which it turned into a rowdy barroom rocker. Hunter traded in his acoustic guitar for an electric one to deliver “Walkin’ With a Mountain” in all its roots rock glory, and he encouraged patrons to “get up and move” to “One of the Boys,” which was part of a set-closing medley that included “Whole Lotta Shakin’ Going On” and just a snippet of “Cleveland Rocks,” a tune from Hunter’s solo career. “All the Young Dudes” put the exclamation mark on a terrific performance that was met by an enthusiastic audience that clearly wanted to thank Hunter and Co. for always acknowledging Cleveland as the great rock ’n’ roll city that it is. Openers the Dream Syndicate delivered a compelling 40-minute opening set that included moody, feedback-driven tunes such as “Halloween” and “Days of Wine and Roses.” The group hardly qualifies as classic-rock but superb musicianship and an energetic performance still managed to make the band appeal to the crowd that was clearly there just to see Mott the Hoople.